Ever Have ‘Hummina, Hummina, Hummina’ Moments? I’ve been asked to join a blog tour. Normally the phrase “blog tour” makes me run screaming from the room, rending my garments and foaming at the mouth, but not this time. Why, you ask? Two reasons. First, because I was invited by DeAnna Knippling over at Wonderland Press. She knows stuff and I’m a little bit scared of her. Her latest release is Alice’s Adventures in Underland: The Queen of Stilled Hearts, a serial set in a Victorian London in which the zombies have been civilized…mostly. It’s a historical dark fantasy about a little girl trapped in her society, and the man who tried to give her the key for getting the better of it. 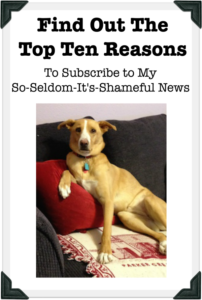 The second reason I joined the blog tour was because this one was so easy. Most of the time blog tours require months of preparation, scads of PR and abstaining from alcohol for the duration. Or so I’ve been told. But here, all I have to do is answer four little questions. The kicker? People actually want to know the answers to these! I know this because they’ve, you know, asked me. 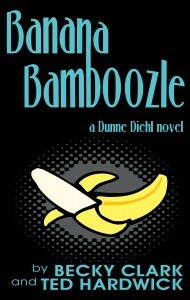 I am about halfway through the first draft of the next Dunne Diehl Mystery, picking up where BANANA BAMBOOZLE left off. I don’t want to give too much away, but MARSHMALLOW MAYHEM involves a dead body, a winter road trip in a recalcitrant RV, edible marijuana, and an adorable, absolutely silent dog, who might actually get a couple chapters of her own. I have fun writing it and I hope people will have fun reading it. I’m also working on some short story background vignettes, for lack of a pithier name. My characters Dan and Cassidy have a long history together and have found themselves in many hilarious situations. But I can’t put them all in the books, so I’m writing separate short pieces for certain escapades. For instance, in BAMBOOZLE I referenced a trip to Las Vegas. So many readers asked me what happened there, that I feel compelled to overlook the rule that what happens in Vegas stays in Vegas. But you’ll only get these short adventures if you sign up for my mailing list. Most cozy mysteries have an element of humor to them, but I’ve been told that BANANA BAMBOOZLE had more than its share of laugh-out-loud moments. I hope that’s true, but I’ve lost all perspective about that. I always think I’m freakin’ hilarious. I tend to write what I like to read, and I love the cozy mystery genre. BAMBOOZLE was my first foray into writing one, however. I was coming off a spate of writing books for kids and a bunch of low-calorie cookbooks so I was itching for a change of pace. I also love funny books, but writing humor is difficult. I wanted to see if I could sustain it through an entire novel, rather than just a blog post or Facebook status update. I am an outliner. It’s not your 5th grade teacher’s outline, though. Ted Hardwick, my fab and funny co-writer, and I have conversations (many of them) so we know the broad strokes of the plot. We hammer out a synopsis from this, which is really just 2 or 3 pages of telling the story, as if we were writing a letter to a friend about something that had happened to us. No specifics, unless it’s germane to the plot ”” clues, characters, locations, snippet of dialogue. Then it gets transformed into an “outline.” I use quotes because it’s really just what has to happen in each chapter or scene to move the story to the end. No Roman numerals or subheads involved. When I wrote BAMBOOZLE I had a trick of stopping every day in the middle of a sentence so I only had to read a couple of sentences and then ”” boom ”” I’m right back in it the next day. For MAYHEM, though, I’m trying something new. In my daily allotted writing time, I force myself to write an entire chapter. It’s a bit bare bones, but I want to get in the habit of writing faster so I can produce at least a book every year. Two would be even better. I love first drafts but hate ”” with the white-hot intensity of ten thousand suns ”” revisions. I’m better at adding purses and jewelry to the outfit of a story rather than pulling a thread and having the entire skirt unravel. That’s a bit about my writing process. Share your process. I love hearing how other writers write and I hope you do too! This entry was posted in Writing, Reading and Publishing and tagged Alice's Adventures in Underland, Banana Bamboozle, cozy mysteries, DeAnna Knippling, funny books, humor writing, MARSHMALLOW MAYHEM, plotter vs pantser, Victorian zombies, Wonderland Press, writing process blog tour, writing with an outline on May 19, 2014 by Becky.